The Crimean War was one of those conflicts that happened mostly because everyone wanted a fight rather than for any particular reason. In essence several rival empires wanted to check the potential progress of the others, and the French were as eager as anyone to stop Russia from taking more lands from the rapidly declining Ottoman Empire. The French army that invaded the Crimea, along with its allies, was to face enormous hardships and lose thousands of lives, yet it participated in relatively few major engagements. The light infantry that went with the army was actually abolished only months after the start of the war, and became regular line infantry. As usual this Strelets set as an all-unique collection of poses, with the large majority being light infantry. The poses pretty much deliver the main requirements, with a high proportion engaged in static firing and none apparently charging - which is entirely appropriate for light infantry. In general the poses are fine, although the desire to make several similar-yet-different poses has resulted in some less than ideal figures such as the bare-headed man (second row, first figure), who has an almost impossible stance. While we appreciate the effort to produce variety, we feel there is nothing wrong with poses such as standing firing having several near-identical figures. We would have liked to have seen a couple of figures on the march, but that is the only obvious omission. The officer with sword and pistol is vibrant yet not a great position, and we felt the flag was too small, though this would rarely have been seen on the battlefield anyway. The two men carrying the ammunition box would be excellent if it were not for the fact that the box is only big enough for a handful of rounds and hardly justifies being carried by two strong men. The men wear the three-quarter-length tunic and the 1844-pattern shako, but the latter has been sculpted too short and squat, making it half way to the kepi, which in any case became the usual headgear for the French on the battlefield. The tunic is a little too straight, and should be tighter at the waist and with fuller skirts, while a few of the figures have straps for the packs despite not having the packs themselves. It seems that it was quite common for the trousers to be left outside the boots rather than tucked in, so we would have liked to have seen some examples of that here, and the feather plumes, though few in number, are out of place here, being more appropriate to the Guard than these men. The sculpting is OK, but some of the detail is a bit rough at the edges (a consequence of the manufacture process used), and areas such as hands are quite poor. Several of those firing are clearly not looking in the direction their weapon is pointing, although most of the poses are realistic and well balanced. The stretcher party is a nice idea, and everything fits together properly, yet two of the men carry the stretcher at different heights, meaning all three cannot have their bases touching the ground at the same time. As before, a good idea that is not well realised. 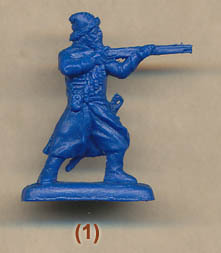 The set includes a small number of zouaves. These troops were initially raised in North Africa, but by the Crimean campaign all were Europeans. These figures are much more active, apparently being involved in close-quarter fighting, as might be expected of such an impressive unit. Some of the poses, particularly those clubbing with their weapon, are not particularly successful, although this is a notoriously difficult pose to perfect. The man leaping a small log (ninth row, last figure apparently playing football) is probably the worst, but those advancing or thrusting with bayonet to the fore are good if a little flat. The clothing is accurate apart from the turban worn around the fez by some, which was only to be seen when in full dress.